Mr. President, We welcome the High Commissioner’s Annual report and echo concerns on a number of Asian situations identified in the report, namely: Burma/Myanmar, Cambodia, India, Indonesia, Maldives, Pakistan, Philippines, Sri Lanka and Thailand. On Burma/Myanmar we welcome the call for this Council to recommend that the General Assembly creates a new independent and impartial mechanism to prepare and expedite criminal proceedings in courts against perpetrators. As the report notes, ethnic cleansing continues and strong suspicions of genocide exist. In this context, we ask the High Commissioner for his thoughts on this Council’s role in justice and accountability in Burma/Myanmar – beyond the International Fact Finding Mission on Myanmar’s final report in September. On Cambodia we echo concerns on freedoms of assembly, association and expression as well as human rights defenders. We regret that this Council failed to take adequate action in its resolution on Cambodia in September 2017. In the months that followed the situation has further disintegrated – we ask the High Commissioner for his views on what the Council could do if there is no improvement in the situation between this Council session and the June session – which falls ahead of national elections in the country. On Maldives we echo concerns on how the state of emergency has undermined the rule of law and call for the release of all political prisoners and the immediate restoration of fundamental freedoms. 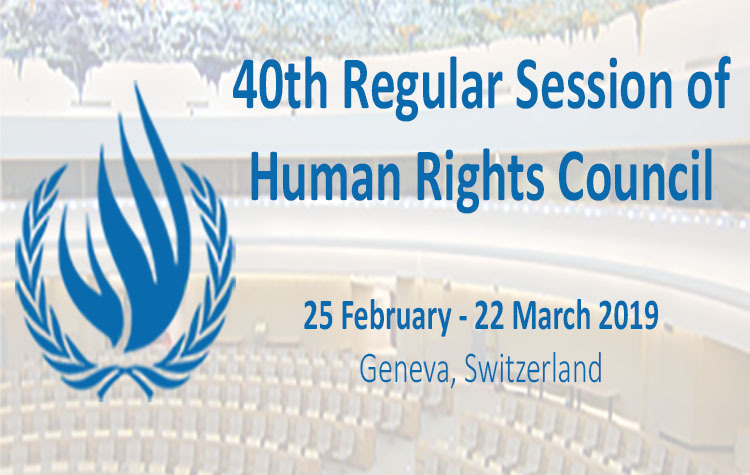 We ask the High Commissioner how outcomes from the impending mission of the office of the High Commissioner for Human Rights (OHCHR) to Maldives could assist this Council in identifying further action – in the absence of significant change before its June session. On Sri Lanka we share concerns on lack of progress in transitional justice, current outbreak of attacks against minorities is connected to this and is deeply concerning. We welcome the encouragement of universal jurisdiction and call on the High Commissioner to elaborate further on what this Council and the UN can do beyond his final report on the country in March 2019 – if meaningful progress continues to be lacking.